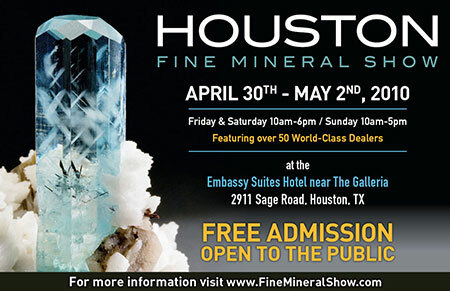 The Houston Fine Mineral Show is an exclusive show highlighting over 50 top mineral dealers. 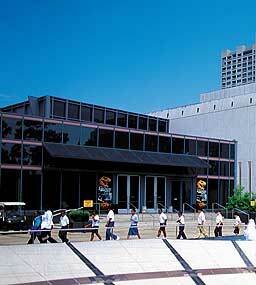 Pala International’s Bill Larson and Will Larson will be attending this year’s show. 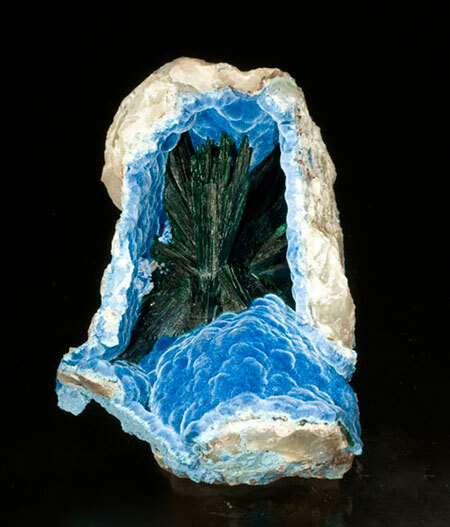 The Houston Fine Mineral Show allows us to promote one of our favorite museums and its stellar collection of mineral specimens: the Houston Museum of Natural Science. The museum’s Cullen Hall of Gems and Minerals “houses the world’s finest display-quality collection of gems and minerals,” according to its own website—and that’s no exaggeration. The hall’s display cases employ fiber-optic lighting and offer 360-degree views of more than 750 specimens that simply must not be forgotten while you’re in H-town. This month we feature two new and fascinating specimens. An intriguing malachite and shattuckite from the Kaokoveld region of Namibia and a hübnerite and quartz from Pasto Bueno, Peru. Our first featured mineral is an amazing shattuckite vug with a acicular malachite spray. The shattuckite is in a blue velvety botryoidal form coating the inside of the little box-shaped vug. The malachite is a dark evergreen color with clusters of tiny needle-shaped crystals. 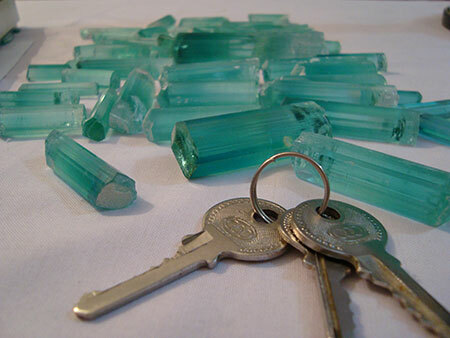 Most crystals grow right into the walls of the pocket, but a few of them actually terminate at the top of the box, just kissing the shattuckite. A limited number of specimens of shattuckite and malachite have surfaced from the Kaokoveld region recently; the aesthetics and wonder that this piece holds go beyond all others of its kind. Our second feature is a dazzling display piece with a ring of jagged white quartz clusters contrasted by lustrous black hübnerite rods. Quartz crystals are slender and clear, ranging from a few millimeters to one 4 centimeters in length on the bottom left that is part of a Japan-law twin. The quartz is interwoven between the hübnerite, and actually penetrates in a few spots. 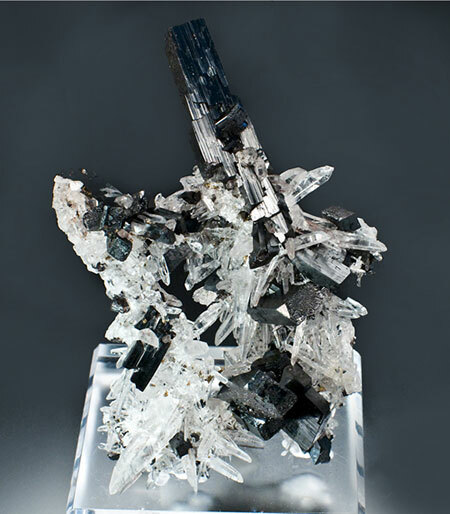 The hübnerite crystals range from several millimeters to a complex 8-centimeter crystal that is perched atop the specimen. It’s a very chaotic and ornate arrangement that keeps drawing you in for a closer look. This magnificent specimen comes to us from Mundo Nuevo in the Pasto Bueno and Ancash Departments in Peru. The following notice was received this week. Congratulations to the Gem and Mineral Council on its first 25 years! More information on the series is available here. And remember friends of Pala International get a 10% discount on any BlueCap order. Just enter the code palaintl when you’re asked for it while ordering. That’s the challenge posed as part of a new BlueCap Productions project—a multi-disc DVD series that moves into the studio of master mineral and gemstone photographer Jeff Scovil. In our previous edition of Pala Mineralis, we featured a photo essay, “Tourmaline Mining in Afghanistan,” contributed by a correspondent in southwestern Asia. 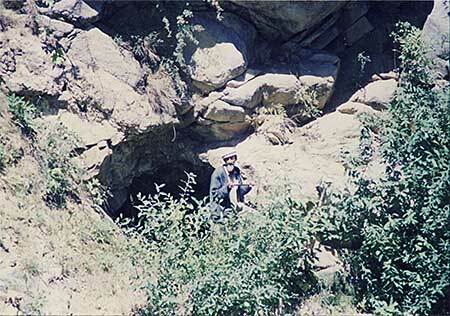 Read his remarks on the tourmaline mining in the general area of the Mawi pegmatites in Nuristan Province. We recently caught up with Elise Skalwold, gemological curator at Cornell University. Our readers may recall “Viking Compass and the Usambara Effect,” which we cherry-picked from her website last June. Well, when she’s not festooning that website with streaming video of growing hydrothermal sapphire in a diamond anvil cell, for the past year she’s been working on a gem and mineral project that remains under wraps. When the curtain is pulled back, however, it will involve among other things a publication featuring photographs by Jeff Scovil, and will include a foreword by Pala’s Bill Larson, who also has kindly provided ad hoc advice along the way. In this edition of our newly dubbed Pala Mineralis e-newsletter we look at the relationships between the sensational specimen and the sentient subject. In the crystal: a whole world, stunning in its simplicity, but with a provenance packed with humankind’s complexities. And we appreciate the yearning of the artist to improve upon nature’s design, or perhaps to pay homage. Design, of course, is a human conceit, but one that is reflected in our every scratching of the sublunary surface. In October, we gave you a peek at what’s in store for vistors to the Westward Look Mineral Show this coming Saturday, February 6. Will Larson will be the “Collector Day” special guest for the annual spotlight, which will showcase his Japanese and worldwide collections. In December, BlueCap Productions issued its own preview of this year’s Collector Day event. In previous years, the event has featured collections from Gail and Jim Spann, Marshall and Charlotte Sussman, and Bryan Lees. When: Saturday, February 6, 10 a.m.–4 p.m. The Tucson shows this year will offer exhibitions and a panel presentation by prominent mineral artists. Westward Look will host the panel on Sunday, February 7. Panelists Eberhard Equit, Hildegard Könighofer, and Susan Robinson will join moderator Wendell Wilson for an overview of their work. The traditional pre-event cocktail hour will allow attendees to browse the work of several other artists, in a concurrent exhibition to feature Chris Hughes, Gail Spann, Fred Wilda, Gamini Ratnavira, Steve Sorrel, Brandy Naugle, Sarah Sudowski. The Tucson Gem and Mineral Show exhibition of the four panelists’ work takes place February 11–14. According to the show brochure, the artists will “display some of their most impressive work next to the stunning gems and minerals that inspired them” and will spend time there to meet attendees. We preview the work of two artists, Hildegard Könighofer and Gamini Ratnavira. A participant in both the Westward Look panel and TGMS exhibition, mineral portraitist Hildegard Könighofer will celebrate at Tucson the publication of a new book, The Mineral Art of Hildegard Könighofer. Accompanying 149 pages of the artist’s paintings are nine articles authored by twelve contributors on topics such as “Science vs Aesthetics,” “Appropriation and Reproduction,” and examinations of notable localities. 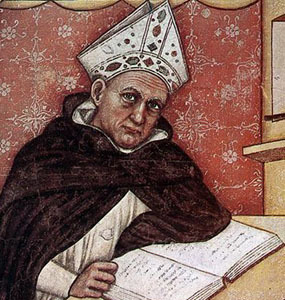 The articles are presented in German and English, with German captions. Two editions are available, but are likely to go quickly. At left is the gray-leather limited edition, which includes a slipcase. 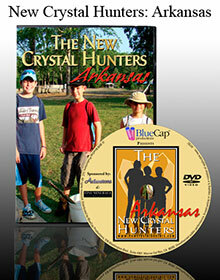 The book is offered exclusively in the U.S. by BlueCap Productions. 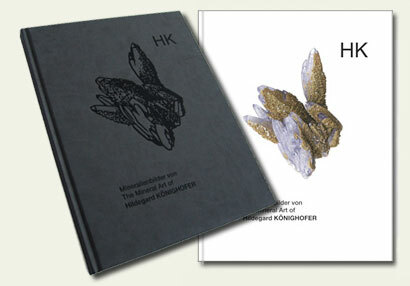 Austrian artist Hildegard Könighofer, along with her partner Dietmar Jakely (a contributor to the new book), is a mineral collector, and has illustrated her own specimens as well as those of the Naturhistorisches Museum Vienna, Landesmuseum Joanneum Graz, and many prominent local collections, according to this Mineralogical Record profile. Like Gamini Ratnavira, Könighofer also paints botanical subjects. Sri Lankan Gamini Ratnavira, whose life and work we profiled in December, is a close, close friend to Pala International, and in fact has his art studio and bird sanctuary on the Pala grounds. His paintings have focused on tropical plants and wildlife, but he has branched out into the world of mineral art with the help of Bill Larson’s choice subjects. He will be in Tucson, joining the group of mineral artists at this year’s Westward Look Show on Sunday evening. 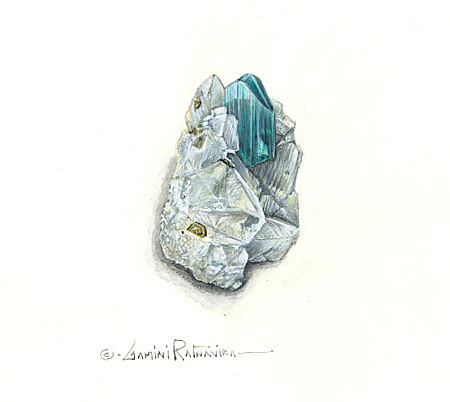 Growing up near the Sri Lankan mines of Ratnapura (“city of gems”), Gamini developed an eye and appreciation for minerals and began painting tourmalines in the 1990s for a forthcoming book by Bill Larson. (Sixty out of a projected 100 of the paintings have been completed.) 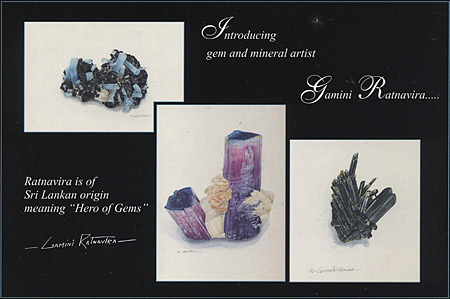 Additionally Gamini has painted dozens of originals for the renowned mineral dealer Dr. 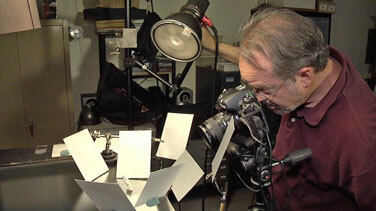 Rob Lavinsky and appears annually at the Tucson Gem and Mineral show. 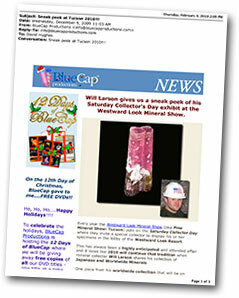 Internationally collected, his artwork can be visited at his website and at his gallery on BlueCap Productions. 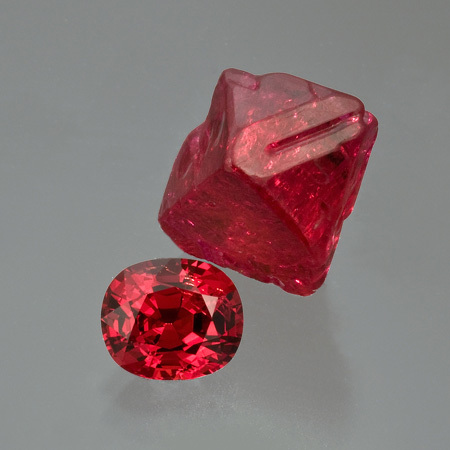 This edition we feature a Burmese red spinel with a single octahedral crystal, in conjunction with the theme of this year’s Tucson Gem and Mineral Show: gem crystals. As the world opens its eyes to new gem varieties, spinel is standing at the front of the line, intense and beautiful. Nothing better than a good ol’ fashioned flame-red spinel. This spinel exhibits the best Burma has to offer, with a slightly orangey red hue, high saturation, and a pleasing cushion cut. If the above discussion generates a jones for musty mineralogical tomes, a return visit to the Virtual Museum is in order. Big Al. Yes, the Virtual Museum has a copy of De Mineralibus Libri; colophon: Patavii, Petrus Maufer for Antonius de Albricis, 20 September 1476. 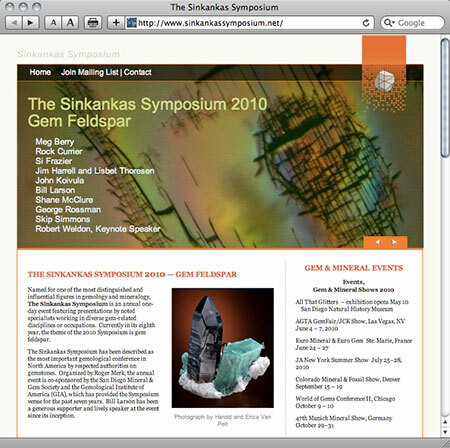 It’s been some time since we looked at the Virtual Museum of the History of Mineralogy. According to the December 2009 Museum newsletter, the most recent additions to the collections have been in the categories most viewed by visitors to the virtual displays: goniometers and crystal models. Since mid-summer, nine of the instruments have been added, as well as a mid-19th century set of twinned feldspar crystal models—a gift from a prominent Berlin collector to a prominent Berlin crystallographer. Also added was a lovely set of indicators for specific gravity measurement, circa late 19th century. 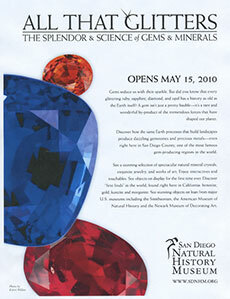 Color zoning in tourmaline is well known to enthusiasts of Southern California minerals. 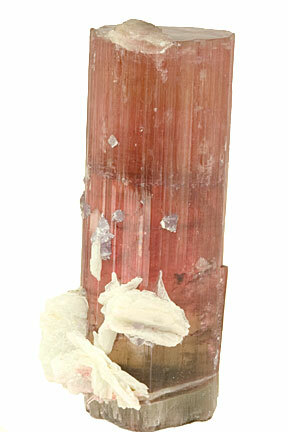 Pala’s Tourmaline Buying Guide includes a couple of lovely examples of the natural phenomenon. Slices of bi-color “watermelon” tourmaline are the centerpieces around which jewelry creations are crafted. San Diego County’s Himalaya Mine, which has a role in our chronicle of Pala International’s 40 years in the trade, produced color-zoned tourmaline for more nearly the entire 20th century. 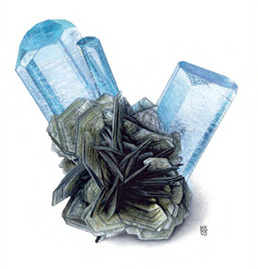 This month, in the Mineralogical Society of America’s journal, American Mineralogist, a remarkable “strongly color-zoned crystal” from the Himalaya is amongst the mine’s specimens discussed at some length. “Tourmaline of the elbaite-schorl series from the Himalaya Mine, Mesa Grande, California: A detailed investigation” (abstracted here) is a study authored by an international group from Europe and the U.S.: Andreas Ertl, George R. Rossman, John M. Hughes, David London, Ying Wang, Julie A. O’Leary, M. Darby Dyar, Stefan Prowatke, Thomas Ludwig, and Ekkehart Tillmanns. The study’s abstract discusses the rising, and sometimes falling, chemical profusions of elements in the color-zoned crystal, pictured above. Samples from the mine were investigated using a range of methods. 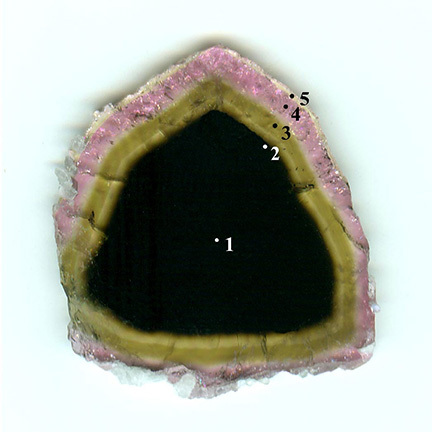 The study concludes with a discussion of the formation of the tourmaline-bearing cavities in the Himalaya Mine’s dike. Himalaya Mine tourmaline, above. A specimen typical of the mine’s fine production. Double-terminated, with cleavelandite and lepidolite. Three quarters pink with one termination a light cat’s eye green. See Inventory #14185. We received the following photos from a new correspondent in southwestern Asia. 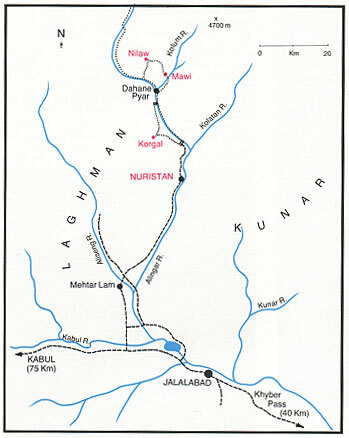 The miners and mines are in the area of the Mawi pegmatites, in Nuristan Province, near its western border with Laghman and Panjshir Provinces. 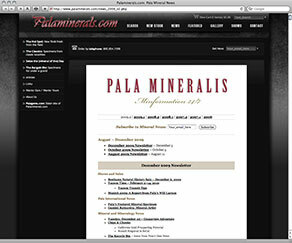 Palagems.com visitors may recognize this mining area from our reprint of Pierre Bariand and J.F. 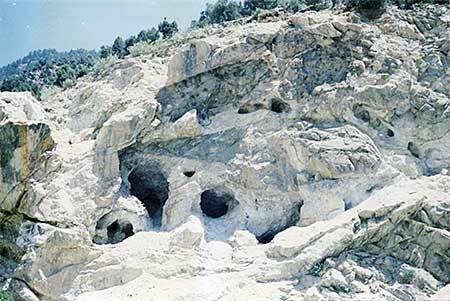 Poullen’s “The Pegmatites of Laghman, Nuristan, Afghanistan,” which appeared in Mineralogical Record in 1978. 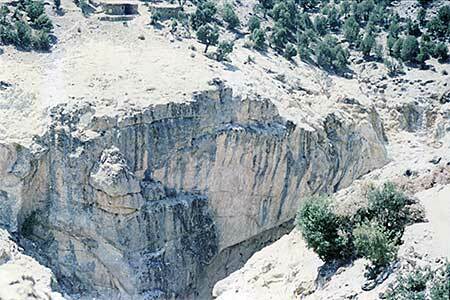 At the time of that writing, it was estimated that the principal vein was 40 meters thick, running for 1,200 meters. Mawi tourmaline. This was one of the fine lots of tourmaline found in Mawi recently. Except for the map below, all photos and captions come from our correspondent, who used an alternate spelling of the pegmatite site, Maway, and the village, Gamatha. Big. 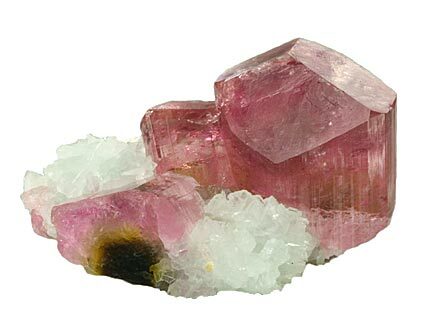 Mawi is one of biggest pegmatites in Afghanistan, famous for big pockets of spodumine, fine tourmaline, aquamarine, and many other pegmatatic minerals. 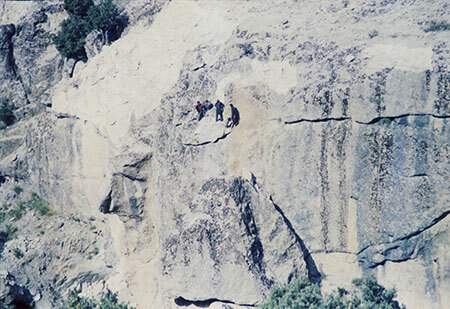 The mountain shown is not a normal mountain; it is a huge pegmatite vein. Bigger. I took this photo to show the size of pegmatite compared with the human body. 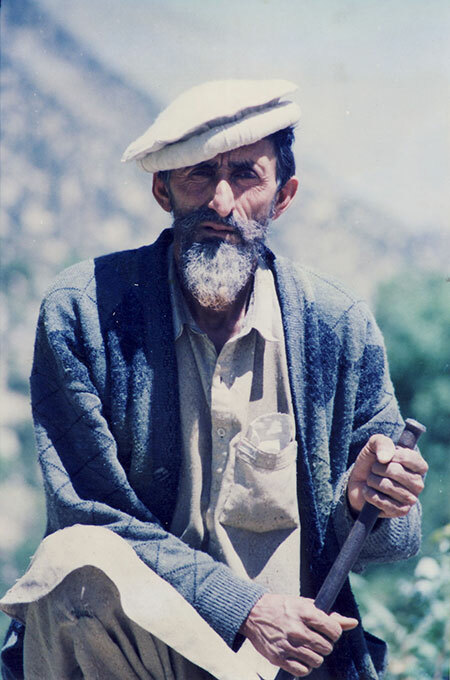 Mr. Khoji is a miner in Gaamata, a village in the Mawi area, and has worked there for the last forty years. 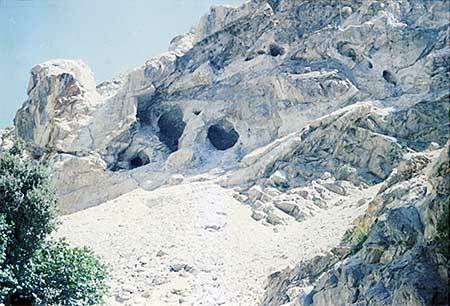 Mawi mine. You can see the pegmatitic veins go in different directions than in a normal mountain. Below is another angle and at the bottom of the mine is the mining debris. Into the mine. Mr. Khoji is going to find some beautiful indicolite for me at Gaamata mine. The crew. 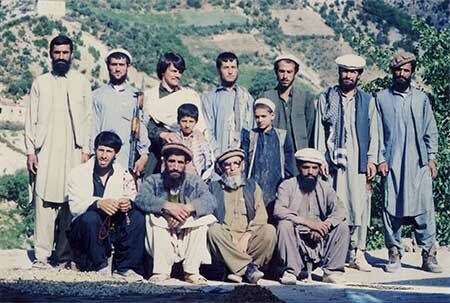 This is the group of miners of Gaamata village. This area has some of the best indicolite in Afghanistan—having copper inclusions and changing to Paraíba-like color after heat treatment. 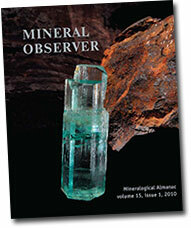 In December, we featured Will The Younger’s report on the phenomenon of Mineralientage München. This month, another world-class venue, Tucson, will feature the appearance of the elder Larson’s take on the Munich show, courtesy of the Russian journal, Mineralogical Almanac. If all goes as planned, the Almanac’s Ludmila Cheshko and Michael Leybov will have copies in tow, at the show.